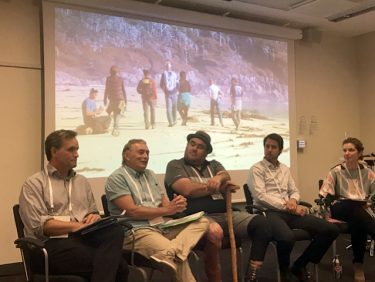 Steve Diggon, John Bones, Dallas Smith, Charlie Short and Meaghan Calcari-Campbell participated in a panel discussion about the Marine Plan Partnership at the international Resilience Conference 2017 in Stockholm. Photo credit: Mary Turnipseed. Four representatives of the Marine Plan Partnership (MaPP) attended the international Resilience 2017 conference in Stockholm, held Aug. 20-23. In a panel discussion chaired by Meaghan Calcari-Campbell of the Gordon and Betty Moore Foundation, they recounted the MaPP planning process in a session titled The Story of How Eighteen Governments Came Together with Marine Spatial Plans that Achieve Stewardship, Social, and Economic Goals. John Bones, marine co-ordinator for the Nanwakolas Council, member of the MaPP Secretariat and co-chair of the North Vancouver Island planning team, spoke about how science, local knowledge and First Nations traditional knowledge were integrated to develop the marine plans. President of the Nanwakolas Council and member of the MaPP Marine Working Group, Dallas Smith, addressed lessons learned from the planning process and the international relevance and inspiration of the co-led partnership to other countries and nations. Charlie Short, executive director of Strategic Projects – Coast Area, Ministry of Forests, Lands, Natural Resource Operations and Rural Development, Province of B.C. described the components of the MaPP planning process. Regional marine planning co-ordinator for Coastal First Nations-Great Bear Initiative and member of the MaPP Secretariat, Steve Diggon, described the move from planning to implementation of the marine plans and the immediate benefits of the plans. Audience members provided congratulatory comments about the achievements of MaPP and asked questions about how the planning team established the B.C.-First Nations partnership and how external partnerships were managed. The theme of this fourth triennial meeting of academics, artists and practitioners was Resilience Frontiers for Global Sustainability. Resilience research is about developing the capacity to sustain development as both slow expected and rapid surprising changes occur in a system. This is accomplished through a diversity of development strategies supported by an understanding of the connections between the strategies. John Bones attended a session about Aboriginal involvement in applying resilience research. “I realized that MaPP accomplished ground-breaking work during the planning phase. Compared to other parts of the world that are attempting to start co-led processes, MaPP has already achieved it,” he said.